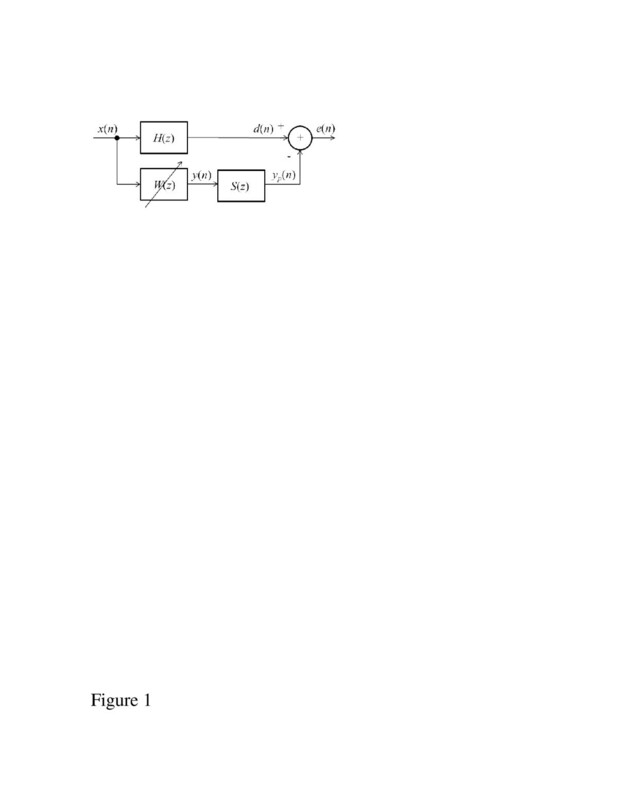 This article develops a new adaptive filter algorithm intended for use in active noise control systems where it is required to place gain or power constraints on the filter output to prevent overdriving the transducer, or to maintain a specified system power budget. When the frequency-domain version of the least-mean-square algorithm is used for the adaptive filter, this limiting can be done directly in the frequency domain, allowing the adaptive filter response to be reduced in frequency regions of constraint violation, with minimal effect at other frequencies. 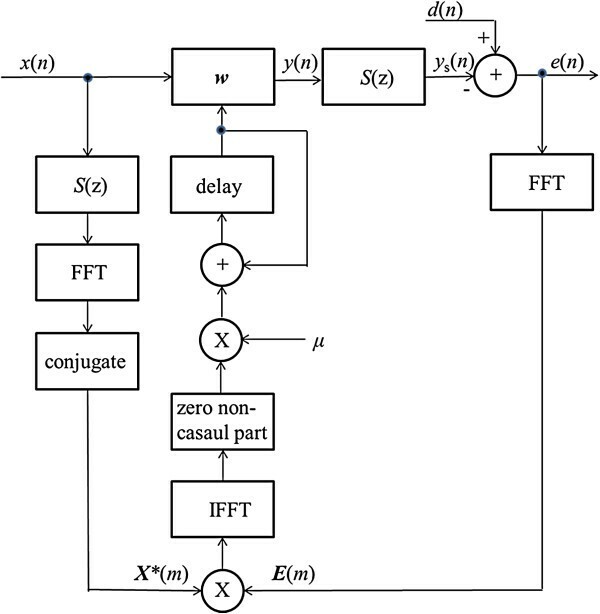 We present the development of a new adaptive filter algorithm that uses a penalty function formulation to place multiple constraints on the filter directly in the frequency domain. The new algorithm performs better than existing ones in terms of improved convergence rate and frequency-selective limiting. Active noise control (ANC) systems can be used to remove interference by generating an anti-noise output that can be used in the system to destructively cancel the interference . In some applications, it is required to limit the maximum output level to prevent overdriving the transducer, or to maintain a specified system power budget. In a frequency-domain implementation of the least-mean-square (LMS) algorithm, the limiting constraints can be placed directly in the frequency domain, allowing the adaptive filter response to be reduced in the frequency regions of constraint violation, with minimal effect at other frequencies . Constraints can be placed on either the filter gain, or filter output power, as appropriate for the application. A general block diagram of an ANC system is illustrated in Figure 1, with H(z) representing the primary path or plant (e.g., an acoustic duct), W(z) representing the adaptive filter, and S(z) representing the secondary path (which may include the D/A converter, power output amplifier, and the transducer). 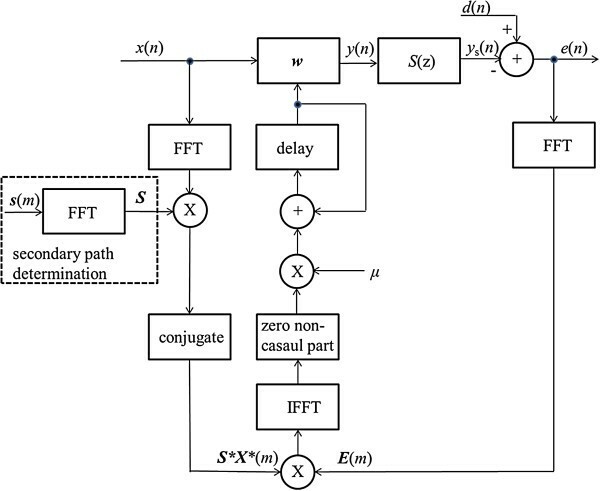 The adaptive filter W(z) typically uses the filtered-X LMS algorithm, where the input to the LMS algorithm is first filtered by an estimate of the secondary path . The adaptive filter will need to simultaneously identify H(z) and equalize S(z), with the additional constraint of limiting the maximum level delivered to S(z). Block diagram of the ANC system. Applications of gain-constrained adaptive systems include systems that use a microphone for feedback, and due to the acoustic path to the microphone notches or peaks occur in the microphone frequency response (which may not be present in other locations). 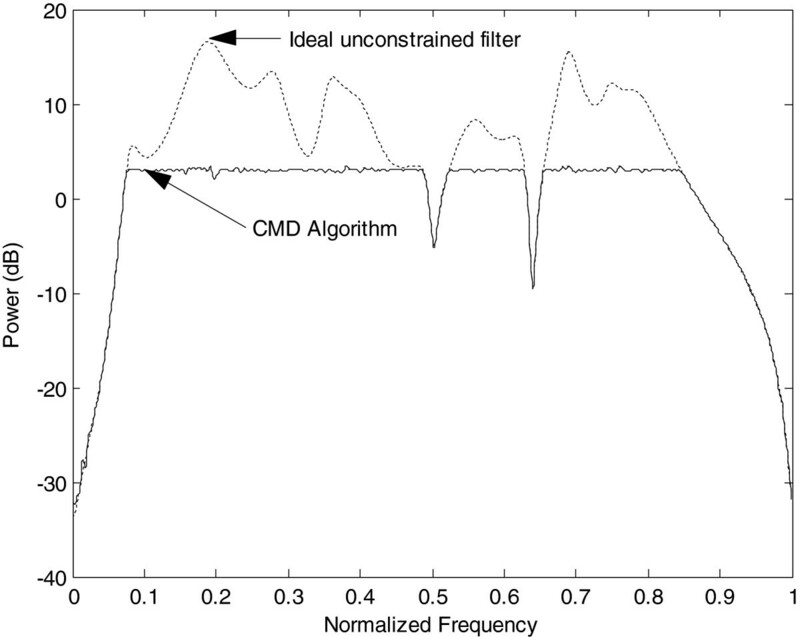 Adding gain constraints to the adaptive filter prevents distortion at those frequencies by limiting the peak magnitude of the filter coefficients . Applications of power-constrained adaptive systems include requirements to limit the maximum power delivered to S(z) to a predetermined constraint value to prevent overdriving the transducer, prevent output amplifier saturation, or prevent other nonlinear behavior . The primary difference between these implementations is that the gain-constrained algorithm does not take the input power into account when determining the constraint violation. Previous implementations of gain and output power limiting include output rescaling, the leaky LMS, and a class of algorithms termed constrained steepest descent (CSD) previously presented in . We develop a new class of gain-constrained and power-constrained algorithms termed constrained minimal disturbance (CMD). The new CMD algorithms provide faster convergence compared to previous algorithms, and the ability to handle multiple constraints. This article is organized as follows. Section 2 presents a review of prior work. Section 3 presents the CMD algorithm development. Section 4 presents a convergence analysis. Section 5 presents simulations with comparisons to other algorithms. Section 6 provides some concluding remarks. Lowercase w, x, e, d, and y are the time-domain representations of their respective frequency-domain counterparts. Vectors will be denoted in boldface, and the subscript k is used to denote an individual component of a vector. The superscript * is used to denote complex conjugate, and the superscript T denotes vector transpose. The parameter μ is used as a convergence step-size coefficient, and the parameter γ is used as a leakage coefficient. if y n + 1 > C y n + 1 = y n + 1 C y n + 1 .
if y n + 1 > C y n + 1 = y n + 1 C y n + 1 w n + 1 = w n + 1 C y n + 1 . Here, in addition to the output being clipped, the adaptive filter weights are also rescaled; filter adaptation continues from the appropriate weight value corresponding to the actual output. w n + 1 = 1 − μγ w n + μe n x n .
The leaky LMS reduces the filter gain each iteration, with the leakage coefficient γ controlling the rate of reduction. The coefficient γ is determined experimentally according to the application, but gain reduction occurs at all frequencies, resulting in a larger steady-state convergence error. 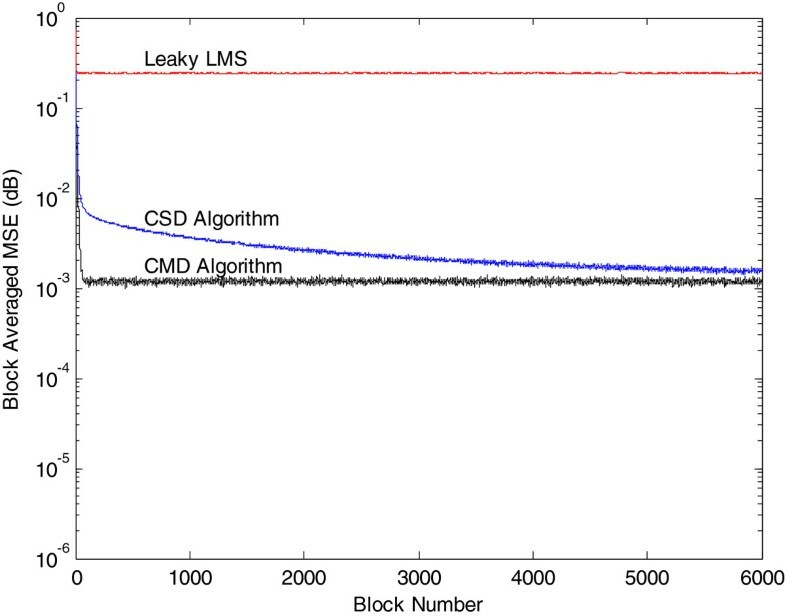 When the leakage is zero, this algorithm reduces to the standard LMS . Block diagram of the delayless ANC system with frequency-domain processing. where 0 is the N-point zero vector. where γ is the leakage factor. where the z subscript sets the result in the brackets to 0 if the value in the brackets is less than 0 (the constraint is satisfied), or to the value of the difference (the constraint is violated). The constraint is individually applied to each frequency bin. Here, α controls the “tightness” of the penalty: a larger α places a stiffer penalty on constraint violation at the expense of a larger steady-state convergence error. w m + 1 = w m + μ IFFT X * m E m − 4 α P m − C Z X m 2 W m + . P m = y m 2 < C .
Note that in (10) there is only one constraint. When used for comparison purposes, we will denote (8) and (9) as constrained steepest descent (CSD) algorithms. The new CMD algorithm will be developed using the principle of minimal disturbance, which states that the weight vector should be changed in a minimal manner from one iteration to the next . A constraint is added for filter convergence, and a constraint is also added for either the filter gain (coefficient’s magnitude in each frequency bin), or the filter output power, depending on which we intend to limit. The method of Lagrange multipliers [11, 12] is then used to solve this constrained optimization problem . D k m = S k m W k m + 1 X k m .
W k m + 1 2 ≤ C k .
∂ J m + 1 ∂ α max , k = W k m + 1 2 − C k 2 z = 0. 1 + 2 α max , k W k m + 1 2 − C k z W k * m + 1 = W k * m + 1 2 λ * S k m X k m .
where the z subscript term will force α k to zero if the constraint of (14) is satisfied. W k m + 1 = 1 1 + α k W k m + 1 2 λ S k * m X k * m .
D k m − S k 1 1 + α k W k m + 1 2 λ S k * m X k * m X k m = 0. D k m − S k m W k m X k m + α k D k m − 1 2 λ S k m 2 X k m 2 = 0.
λ = 2 E k m + α k D k m S k m 2 X k m 2 . W k m + 1 = 1 1 + α k W k m + μ E k m + α k D k m S k m 2 X k m S k * m X k * m .
W k m + 1 = 1 + μ α k 1 + α k W k m + μ S k m 2 X k m 2 S k * m X k * m E k m .
W k m + 1 = 1 1 + α k W k m + μ S k m 2 X k m 2 S k * m X k * m E k m .
W k m + 1 = 1 − μ γ k W k m + μ k S k * m X k * m E k m .
is a diagonal matrix of variable leakage factors as determined by (28). where β is a smoothing constant slightly less than 1. (Note: In equations such as (31) which use an estimated power value in the denominator, low power in a particular frequency bin may result in division by a very small number, potentially causing numerical instability. To guard against this, a small positive regularization parameter is added to the denominator to ensure numerical stability ). Block diagram of the CMD adaptive filter with frequency-domain processing. If the constraint of (14) is violated, the CMD algorithm will reduce the magnitude of the adaptive filter frequency response in proportion to the level of constraint violation. 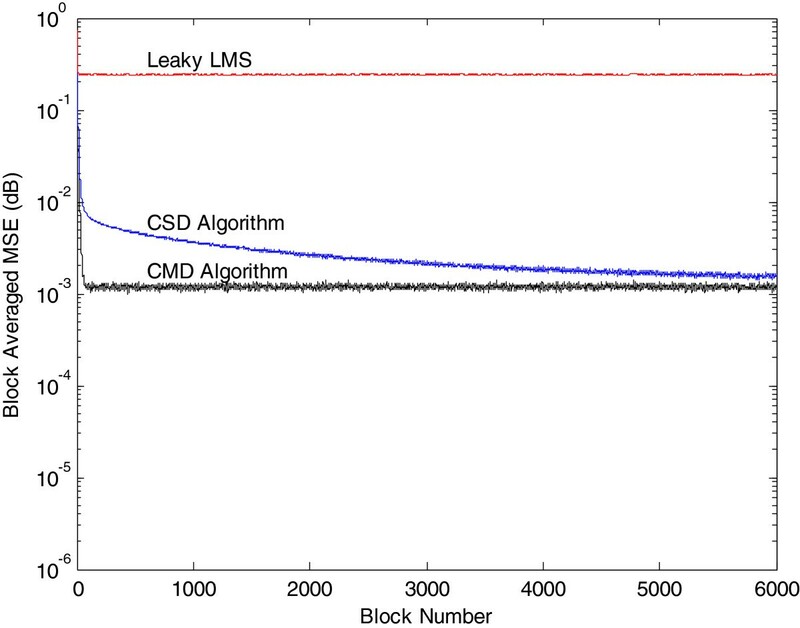 The CMD algorithm normalizes the weight update in a manner similar to the normalized-LMS with leakage. The amount of leakage is dependent on the level of constraint violation. The CMD algorithm scales the weight update by the inverse of secondary path frequency response, resulting in a faster convergence in regions corresponding to valleys (low magnitude response) in the secondary path. P y m + 1 = 1 N ∑ k = 0 N − 1 W k m + 1 2 X k m 2 . J m + 1 = δ W k m + 1 2 + Re λ * D k m − S k m W k m + 1 X k m + α max , k P y m + 1 − C 2 z . ∂ J m + 1 ∂ α max , k = P y m + 1 − C 2 z = 0. 2 α max , k X k m 2 P y m + 1 − C z W k * m + 1 + W k * m + 1 = W k * m + 1 2 λ * S k m X k m .
α k = 2 α max , k X k m 2 P y , k m − C k z . Following a development similar to the gain-constrained case results in the CMD algorithm given by (31) using a new diagonal matrix of leakage factors (32). P y , k m + 1 = W k m + 1 2 P x , k m + 1 . P y , k m + 1 ≤ C k .
J m + 1 = δ W k m + 1 2 + Re λ * D k m − S k m W k m + 1 X k m + α max , k P y , k m + 1 − C k 2 z . ∂ J m + 1 ∂ α max , k = P y , k m + 1 − C k 2 z = 0. 2 α max , k X k m 2 P y , k m + 1 − C k z W k * m + 1 + W k * m + 1 = W k * m + 1 2 λ * S k m X k m .
Following a development similar to the gain-constrained case, and using a new diagonal matrix of leakage factors (32) results in the CMD algorithm, repeated below. Γ m = diag γ 0 m , γ 1 m , … , γ 2 N − 1 m .
We assume that all signals are white, zero-mean, Gaussian wide-sense stationary, and employ the independence assumption  under a steady-state condition, where the constraint violation is constant and the transform-domain weights are mutually uncorrelated (which occurs as the filter size N grows large ). We will also use a normalized input power of unity in (34), which then allows the analysis to apply to both gain-constrained and power-constrained cases. Uncorrelated white measurement noise with a variance of σ n 2 will be denoted by η k .
which converges in the limit to the steady-state solution W k, ss. E V k m + 1 V k * m + 1 = [ ( 1 − 2 μ γ k + 1 + μ 2 γ k 2 + 2 γ k + 1 ] E V k m V k * m + μ 2 σ n 2 X k m 2 + μ 2 γ k 2 W k , ss m 2 − 2 μ γ k 1 − μ γ k + 1 W k , ss * E V k m .
A 11 = 1 − 2 μ γ k + 1 + μ 2 γ k 2 + 2 γ k + 1 A 12 = − 2 μ γ k 1 − μ γ k + 1 W k , ss * A 22 = 1 − μ γ k + 1 B 1 = μ 2 σ n 2 X k m 2 + γ k 2 W k , ss m 2 B 2 = − μ γ k W k , ss . In the simulations, the experimental data from  is used for the plant, modeled by a 512-term all-zero filter centered at N/2. The output rescaling algorithm (2) is applied in the frequency-domain to determine the steady-state adaptive filter final coefficients. 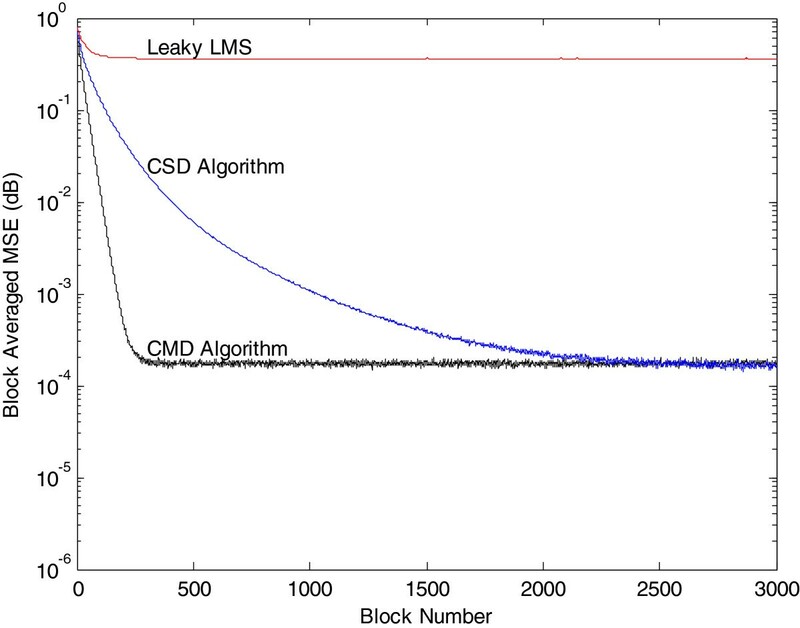 We demonstrate the improved convergence performance of the CMD algorithm as compared to the CSD algorithm and the leaky LMS in both gain-constrained and power-constrained applications. The values of constraint terms C, α maxk , and C k are held constant in the simulations, but could be shaped over frequency for specific applications. External uncorrelated Gaussian white noise with a variance of 0.01 is added for the convergence comparisons, and an average of 100 runs is plotted. In the simulations, we are assuming prior knowledge of the secondary path transfer function; methods for on-line and off-line secondary path identification are presented in, e.g., [20, 21]. Using a unity gain secondary path, a 3-dB coefficient gain constraint is imposed, and Figure 4 shows the plant frequency response and the response of the new CMD algorithm, illustrating the clipping effect of the algorithm. Frequency response of gain-constrained CMD algorithm. 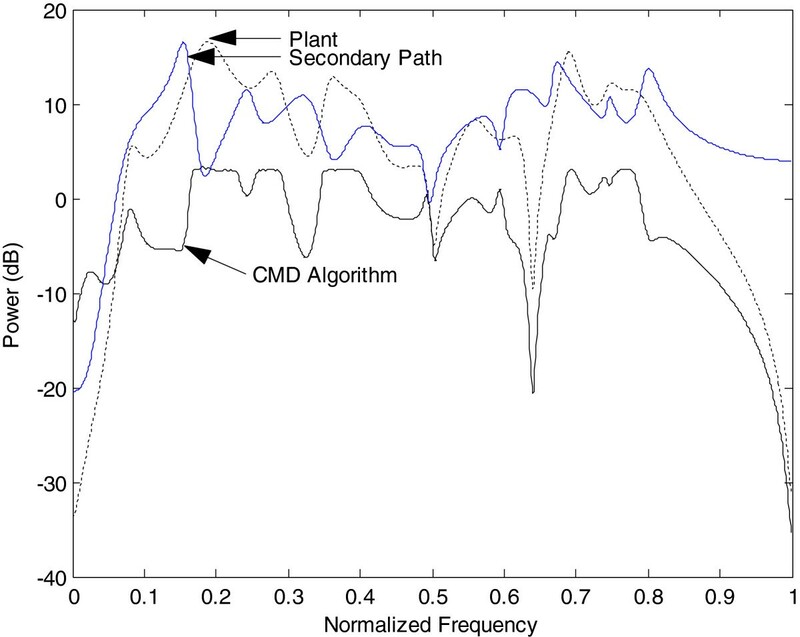 Frequency response of gain-constrained CMD algorithm with secondary path. Figure 7 compares the convergence of the three algorithms for colored noise input, created by filtering the input with a first order AR(1) low pass filter process with coefficients [1–0.95]. The CSD algorithm requires a significant reduction of μ in (8) to maintain stability, resulting in a slow response. However, the increased energy in the lower frequency regions due to the low pass input process improved the misadjustment for this case. 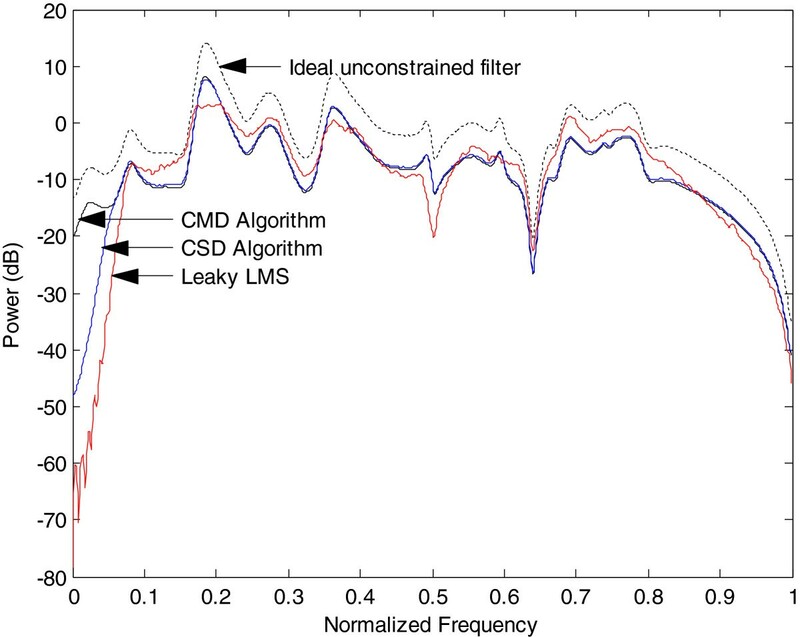 The leaky LMS attenuates all frequencies (and not just those in violation of the constraint) and has the poorest convergence performance and highest excess misadjustment. Convergence comparison, gain-constrained condition, AR(1) colored noise input. The frequency response and convergence of the three algorithms is compared in Figures 8 and 9, respectively, using a single output power constraint of 25% of the unconstrained value (−6 dB). The CMD algorithm has the fastest convergence performance and maintains a 6-dB power reduction over frequency. The CSD displays similar performance, but again was not able to fully achieve the relatively high 20 dB gain required at the lowest frequencies. The leaky LMS has the poorest convergence performance, primarily due to its inability to track the lowest frequencies. Both the CMD and CSD algorithms allow the power constraint to be set explicitly, while the leaky LMS requires a trial and error approach to determine the parameters. Frequency response comparison, power-constrained condition. 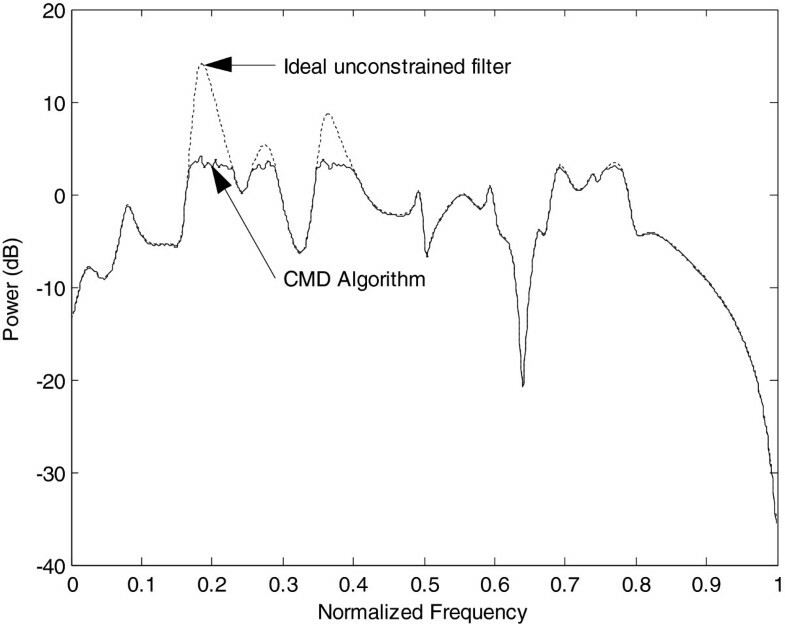 The CMD algorithm frequency response for the individual bin-constrained case using the constraint of (44) is shown in Figure 10 for a 3-dB power limit with a wideband white noise input. Comparing this to Figure 8 illustrates how the new CMD algorithm reduces the output in the frequencies of power-constraint violation, while minimizing the effect at other frequencies. A new algorithm was presented, the CMD LMS, for gain-constrained and power-constrained adaptive filter applications. Analysis results were developed for the stability bounds in the mean and mean-square sense. 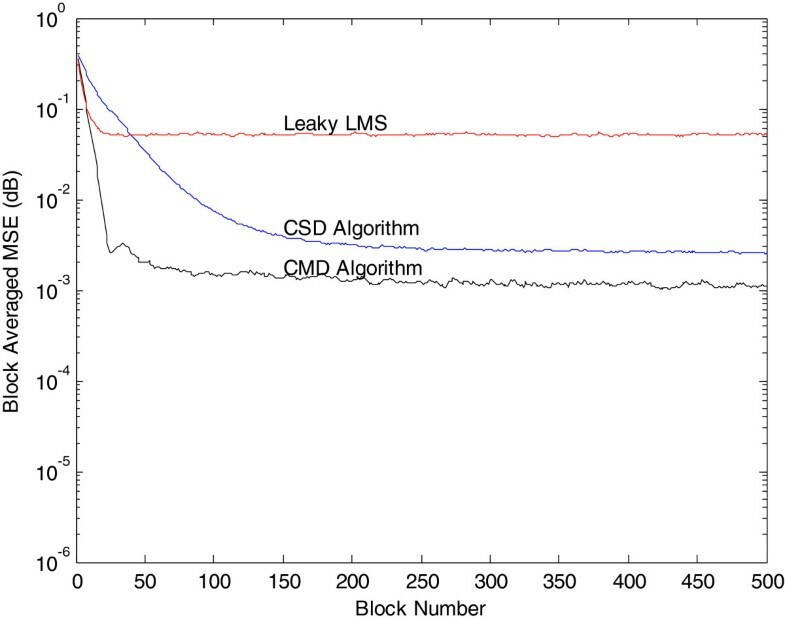 The CMD algorithm was compared to the algorithm developed in  and the leaky LMS for filtered-X ANC applications. The new CMD algorithm provides faster convergence and improved frequency response performance, especially in colored noise environments. Additionally, the new CMD algorithm has the ability to handle multiple constraints in both gain-constrained and power-constrained applications. WJK and TO derived the equations, carried out and reviewed the simulations, and drafted the manuscript. Both authors read and approved the final manuscript.